Incorporating salads regularly into my diet is one way that I try to stay healthy. It’s not always easy to get my greens in though. I find getting my vegetables in is the hardest food group for me. Carbs no problem. Veggies take more planning and effort. I’ve been experimenting with different salad recipes, and I discovered this amazing Berry Chicken Salad with Balsamic Strawberry Dressing. I could eat this every week, it’s that good! This salad is packed with superfoods! Superfoods are mostly plant-based and are packed full of nutrients. They have loads of vitamins and minerals to help us live a longer, healthier life. 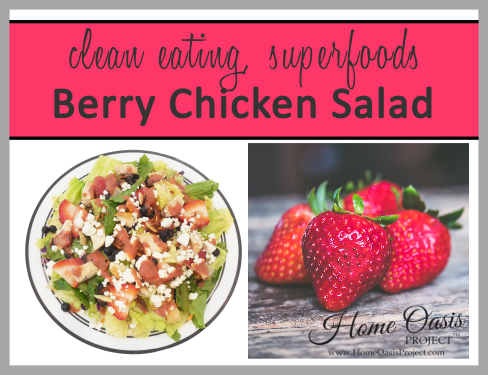 Our Berry Chicken Salad contains superfoods that include antioxidants, healthy fat, and fiber. All of which research shows helps to ward off cancer, prevent heart disease and diabetes, and aide in digestion and gut health. 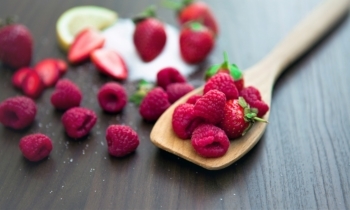 The American Heart Association has great information on Superfoods that you can read by clicking here. You can get a list of the top superfoods here. In a pan over medium heat add the olive oil. Cook the chicken breasts fully and set aside to rest. Keep the oil from chicken in the pan and add the almonds. Cook until slightly browned and set aside. After the chicken has rested for about 5 minutes, slice into bite sized pieces. Mix together the romaine, spinach, and kale. Toss in the strawberries and blueberries. Add the goat cheese, chia seeds, almonds, and chicken to the salad. Prepare the dressing by mixing by hand in a small bowl or in a blender the strawberry jam, balsamic vinegar, olive oil, salt and pepper, and strawberries. 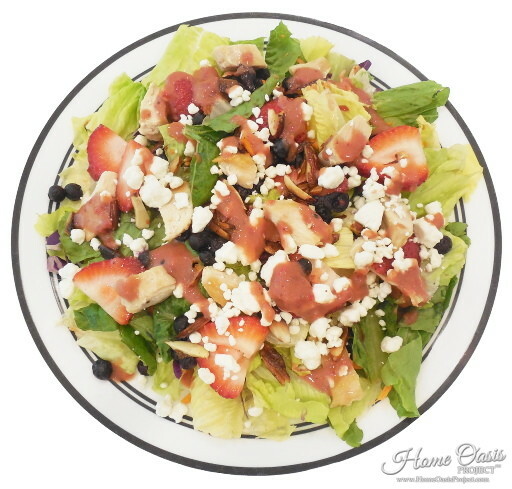 Drizzle on top of the salad and enjoy!